Ohio Secretary of State Jon Husted, right, speaks alongside, Ohio Attorney General and former U.S. Sen. Mike DeWine, center right, Fran DeWine, center left, and Tina Husted, left, during a news conference at the University of Dayton to announce their decision to share the ticket in their bid for the Ohio governorship on Thursday in Dayton. COLUMBUS — Ohio’s race for governor kicked into high gear Thursday as a major Republican merger and a big Democrat’s expected entry saw the 2018 field begin to sort itself out. Attorney General Mike DeWine announced on Thursday that rival Jon Husted, the secretary of state, will be his running mate. 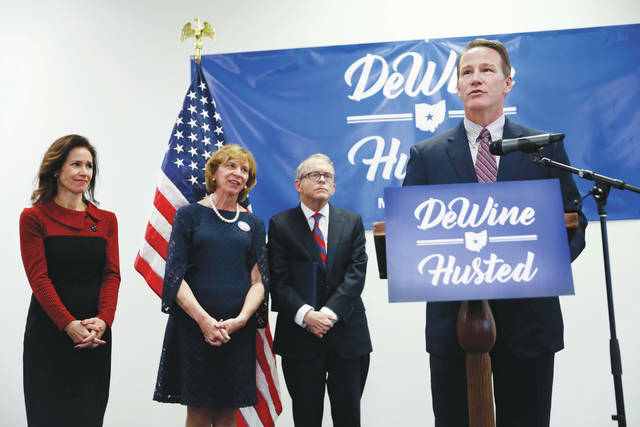 The 70-year-old DeWine called Husted experienced, ready, determined and “uniquely qualified” for the job of lieutenant governor. At an announcement event in Dayton, Husted, 50, said he and DeWine will do best working together. “We can do more as a team than as individuals,” he said. DeWine is a former U.S. senator, lieutenant governor and local prosecutor. Husted is a two-term elections chief, former state senator and House Speaker. Taylor has served two terms as lieutenant governor to Republican Gov. John Kasich, who is term-limited. She said the 70-year-old DeWine “is the past” and her campaign represents the future. The 51-year-old is the only Republican woman running for a statewide office. That would leave U.S. Rep. Jim Renacci, of Wadsworth, whose campaign is largely self-funded, to take on the DeWine-Husted partnership in the May 8 Republican primary. Renacci’s campaign reported raising about $575,000 as of July, which included $13,000 from his congressional committee, and accepting a $4 million personal loan from the candidate. Husted’s campaign reported $4.2 million on hand in July, and DeWine’s had nearly $4.7 million in the bank. Meanwhile, on the Democratic side, Jerry Springer announced he wouldn’t run for governor. Some in the party — including former Ohio Gov. Ted Strickland — had viewed the tabloid talk show host as a potentially powerful candidate in the age of President Donald Trump to win back the state from Republicans. GOP Gov. John Kasich, a 2016 presidential contender, is unable to run again due to term limits. Springer’s announcement on a weekly podcast came days after Democrat Richard Cordray left his job as federal consumer watchdog, a move viewed as positioning him for the launch of a gubernatorial bid. The former state attorney general and treasurer was one of the last Obama-era holdouts in the Trump administration, where he had led the Consumer Financial Protection Bureau. He’s viewed as a larger threat to Republicans than any of the five Democrats running so far, including former U.S. Rep. Betty Sutton, Dayton Mayor Nan Whaley and Ohio Supreme Court Justice Bill O’Neill. Sutton painted DeWine and Husted on Thursday as political insiders.